Once upon a time, my crayon box exploded. I was in shock at all of the color and geometry in front of me. I had a similar feeling the first time I saw Muffinhead in photographs. He was not so much a creature of the night as a creature of the nightlife, extending his hand and parading toward me in bright white, red, black, and lord knows what else. As a person always bedazzled by color and costume, I was instantly smitten with this living, moving, breathing art form and filled with the desire to raid his closet. We at OXHEART and Bodega de la Haba are utterly thrilled to welcome Muffinhead, living art performer (note the active avoidance of phrase "performance artist") and illustrator, to our May 1 event, "The Wrong of Spring. "* He has been kind enough to answer a few questions about his enchanting work below. 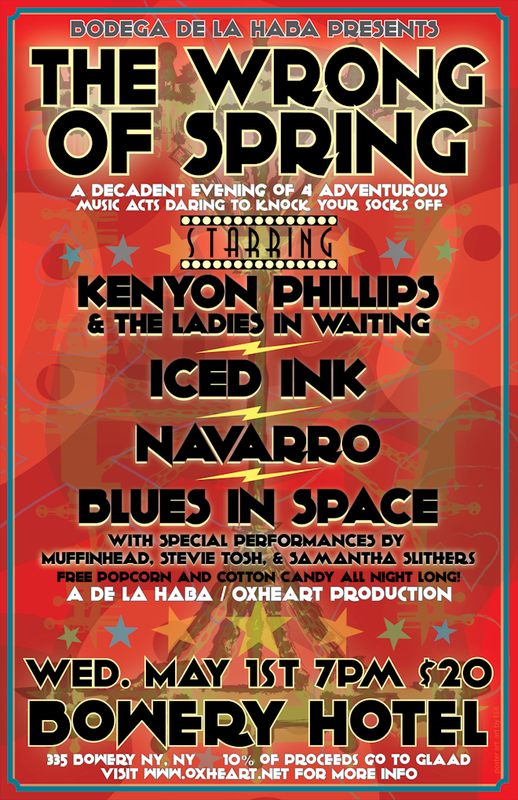 In case you didn't catch the last blog post, "The Wrong of Spring" will be held at the divine Bowery Hotel. Tickets are $15 in advance at tickets.oxheart.net, and $20 at the door. Doors open at 7pm! We'll have free cotton candy and popcorn all night, plus amazing avant-garde rock musicians, fancy light performances, and a lady who dances with snakes. Hell yeah. Won't you join us, dahlings? Hoping to see your gorgeous faces there. 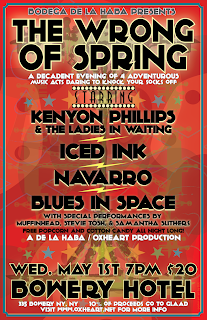 of OXHEART/BODEGA DE LA HABA's "THE WRONG OF SPRING"
How did the idea for Muffinhead arise? What are your goals with each presentation/performance? I'm glad you caught that, I've always thought of Muffinhead as an idea that goes a bit beyond a character or characters I've invented. Honestly, the concept came about when I was still in LA-I was going to be showing work for the first time in some underground gallery spaces and I felt that my work needed to be represented by something other than a man in reading glasses and a suit. The name itself was whispered to me, strangely enough. I was waking up one day and I literally heard the name whispered into my ear. I realized right away that this was my name and it has been ever since. What can OXHEART-goers expect from a Muffinhead performance? Sometimes I'm not sure what to expect myself! A lot of times I'll come up with a vision of what I'm doing just a few days in advance...I always start with something of a look and that look becomes a live painting of sorts in the right environment...actually this time I think I'll play a tree; that way I won't have to speak or move! Very springy, right? What inspires your costume designs, and how long does it take you to construct each one? Where and how do you store them? That's a funny question because I really don't know where it all comes from. Partially I think it has to do with the boredom I feel from modern fashion. I think there are so many ways to push an envelope and so few of those possibilities are ever utilized-so it seems to be a revolutionary or a slightly illegal act when those wayward fantasies are appropriated toward reality. I don't know, I just happen to wander out of the box a lot I suppose. Ohhh I just store them all in my house. Store is a light word, they're actually starting to eat my house alive. What do you do when you're not performing? I'm always working! I work nightlife quite a lot and do a bit of design work as well as the accessories line I'm beginning called "Muffinhead: TKo Accessories" which I'm launching in May. What is your artistic background like? I've been drawing and making art since I was a child, like most artists. It's the only thing I've ever felt that I belong to. It's my religion in a way. I'm also self taught, never went to art school which works because I think it would've ruined art for me in retrospect: the freedom and love of it all can't be explained. What role does New York nightlife play in your work? How did you get involved in that scene? Nightlife plays a huge role in my work. It's my gallery in many ways. I've never really been accepted in the art world I feel but nightlife always took me in. 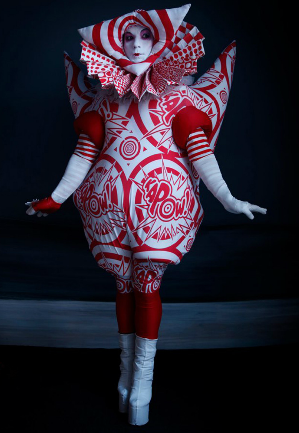 Now I'm at a point with events like Susanne Bartsch's Catwalk where I can display myself as a living painting and an installation all at once. It feels great, and most importantly, it feels like we've stumbled upon a new genre. What are your goals for your work in the future?